Introduction: One of the great things about this non-paying job is the books you review and the people you interview. TATTOO is no exception. The folks at Caberdancer Graphic Design, Inc. are to be warmly congratulated for the first class job they did on their first TATTOO attempt. If I were speaking to a crowd of Scots right now, I would ask for a great round of applause for TATTOO! Here is a wee interview with the editor of TATTOO, Tom Freeman, a gentleman you all need to meet. Our own Beth Gay, as well known as anyone in the Scottish Community, is Associate Editor of this magazine. Q: How did you and the folks at Caberdancer come up with the idea of publishing TATTOO, Presenting The Highland Games of the Southeastern US 2006? A. Caberdancer president, Ron Wright, came up with the idea while doing some intensive research into the subtleties of single malt one afternoon on the porch. We had received lots of calls at the office asking for information about upcoming games in our area. It seemed a logical assumption that there was a need for a publication of that sort. Q: Since this is a new concept concerning Highland and Scottish games (I do not believe I have ever seen this type publication before), how long did it take you and your staff from the initial concept to publication, including selling the ads, etc.? A: Nine months of planning and six weeks of intensive effort (The editorial staff is still recovering at an undisclosed location!). We wanted to offer readers in the Scottish community a one-stop information source that would tell them all they needed to know about Games in the Southeast. Q: TATTOO has a variety of items other than the game dates and the various ads for the games. I do not recall this concept before - mixing games information with Scottish articles by different writers - so, I'm interested in how this idea emerged for TATTOO. Can you tell us about this segment of TATTOO? A: Bethie suggested we add editorial content that would be both entertaining and informative about Scottish culture for those who were new to the Highland games and those who were just beginning to learn about their Scottish heritage. Being a perceptive editor I was quick to usurp the cleverness of my staff. TATTOO was extremely fortunate to enjoy editorial contributions from highly respected and knowledgeable individuals from the Scottish-American community. Q: Will there be future issues of TATTOO? If so, will you seek to enlarge the scope of the magazine itself and include other games than those in the Southeastern part of the country? Do you envision your publication eventually becoming a national publication including all of the games in America? What about games in Scotland? Will they find their way into future editions? A: The present plan is to release a new issue of TATTOO yearly. We hope to include more games from the Southeast as well as coverage of games from such exotic lands as California, Arizona and Colorado! Perhaps, we will have games from Michigan and New Jersey! We also plan to include a feature about "A Day at a Modern Scottish Games" and perhaps coverage of Games in Canada as well. 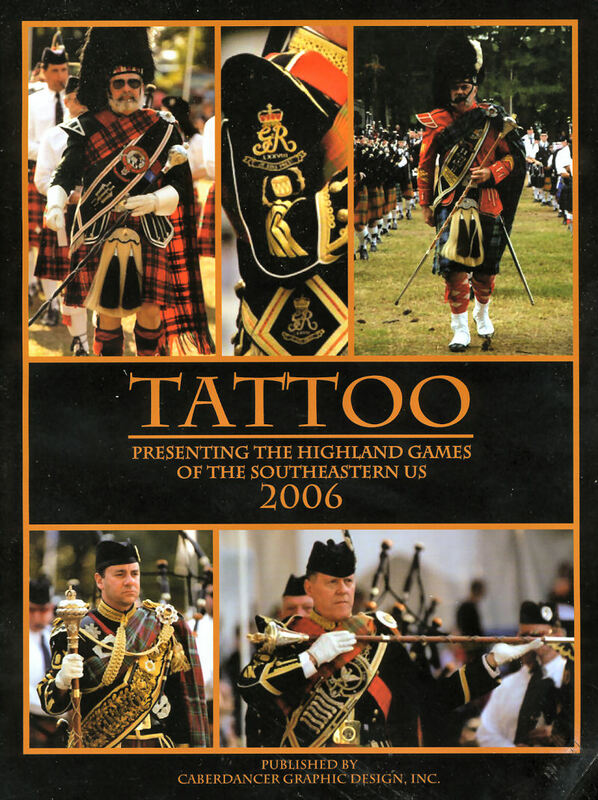 With luck and the support of our readers and contributors, it's not too big a stretch of the imagination to see TATTOO becoming an international guide to the Highland Games. Q: Please tell our readers how to secure a copy of this publication and how much it is, including postage? Will they be sold at Highland Games? A: Copies are available from Caberdancer Graphic Design, Inc., at: 909 West Main Street, Walhalla, SC 29691. Call 864-718-8102 or email sales@caberdancer.com. Copies will also be available at Highland Games where Caberdancer - alias "The Mighty Clan MacBubba Society, International" - appears. You also may send a check for $15.00 plus Priority Mail $4.10 - $19.10 total. (Up to four copies will mail for $4.10 PM.) Negotiations are under way to make the publication available from national booksellers. Q: Would you tell us a little something about your company and your staff? Where is Walhalla, SC? A: Walhalla is a small town located in the northwestern corner of South Carolina at the foot of the Blue Ridge Mountains. Caberdancer is a graphic design company founded in 2001 by Ronald A. Wright, Rebecca Prather and Thomas R. Freeman, Jr. We have recently been fortunate to enjoy the talents of Beth Gay, editor of The Family Tree. Ron juggles the books, Becky sells ice to Eskimos and I doodle. Beth can type. Though, in a small company, everybody wears many Balmorals. Caberdancer began as a general services design company focused mainly on industrial applications. Since vending at our first Scottish games, Charleston, SC in 2001, however, we have found more and more of our business to be focused on the Celtic community. Our corporate philosophy is, "To provide unique design and production services to the Scottish - American community and to include in the process as much fun as possible." Q: Thanks, Tom, for this interview. Is there a closing word you would like to share with our readers? A: We'd like to thank everyone for their generous support. If anyone has suggestions for making TATTOO a better publication, we welcome their input. We all work hard enough so everyone treat yourselves to a Highland games...soon and often. In the meantime, here's to keeping your kilt dry, your whistle wet and your haggis out of the fire!